Throughout the United States, we are feeling the rippling effects of family separation policies by immigration officials. How do we explain these painful experiences to children? How do we hear and honor children's stories? My father's family was torn apart by World War II, and I have always found refugee stories powerful. They let me connect to my own family's history, and help me extend my grandmother's experiences to those of children in my classroom. Here are a few books that I would recommend to children ages 9 to 14. For younger readers, seek out Front Desk and Stormy Shores. Older readers will appreciate the suspense and understand the terrifying situations in The Only Road and Refugee. 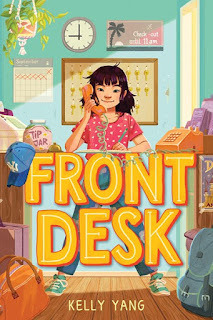 Front Desk, by Kelly Yang (Scholastic, 2018): Mia's family has recently immigrated from China, and finding a steady job has been really tough for her parents. When an opportunity to manage a motel comes their way, they leap at it. Mia's excited that she can help out, managing the front desk while her parents clean the rooms. Kelly Yang bases this story on her own experience, immigrating from China to Los Angeles. She weaves humor and compassion into her story, while frankly addressing poverty, bullying and the importance of family. The Only Road, by Alexandra Diaz (Simon & Schuster, 2016): Twelve-year-old Jaime flees his home in Guatemala after a local drug gang kills his cousin Miguel. Jaime and Angela, Miguel's sister, travel north alone, navigating the treacherous journey by bus, train and foot. This gripping novel not only shows the violence and abuse Jaime and Angela survive, but also how painful family separation is for children. 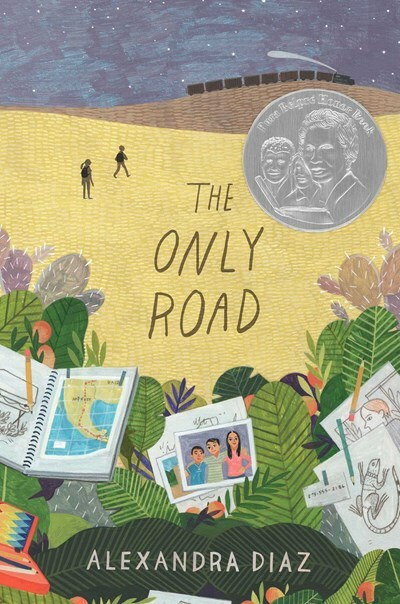 Alexandra Diaz has been honored with the Pura Belpre Author Honor Award, the Américas Award and was a finalist for the International Latino Book Award. I'm excited that The Crossroads, the sequel to The Only Road, will be published in September. 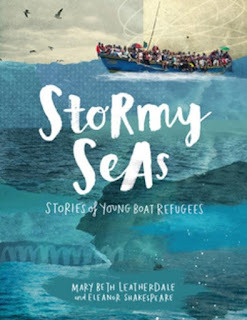 Stormy Seas: Stories of Young Boat Refugees, by Mary Beth Leatherdale (Annick Press, 2017): This powerful nonfiction book combines brief memoirs, clear information and dynamic collage illustrations, making this an engaging introduction to immigration experiences of children during 20th and 21st centuries. Each chapter focuses on a child fleeing war, oppression and conflict in Nazi Germany, Vietnam, Cuba, Afghanistan, and Africa’s Ivory Coast. 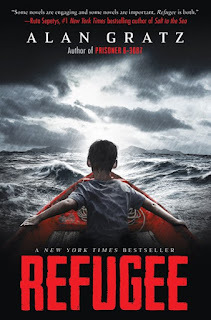 Refugee, by Alan Gratz (Scholastic, 2017): Gratz alternates the stories of three children from different periods of time, each of whom are fleeing their homes in search of refuge. Josef is escaping persecution from Nazis in Germany during World War II. Isabel and her family are fleeing Cuba in 1994, escaping the riots and unrest under Castro's rule. And Mahmoud's family flees Syria in 2015 after their home was bombed. These parallel stories are engrossing and compelling. The structure keeps the suspense high, and helps readers see how each character must cope with extreme stress, separation and loss. Gratz uses historical fiction at its best to help readers understand global issues in a way that inspires hope and empathy. If you're looking for more stories like these, check out my Goodreads shelf: Immigration. If you make a purchase using the Amazon links on this site, a small portion goes to Great Kid Books. Thank you for your support. Are you looking for a book to keep your kids laughing and asking for more? Do they love goofy, over-the-top stories with lots of illustrations? My students love-love-love Andy Griffiths' Treehouse series. What kids wouldn't want their own ever-expanding treehouse, with a bowling alley, a limitless marshmallow-launcher, a swimming pool, a watermelon-smashing room, and a rocket-powered carrot-launcher?!?! The Treehouse series originated in Australia and has become a best-seller in the United States, Britain, the Netherlands, Norway and South Korea. 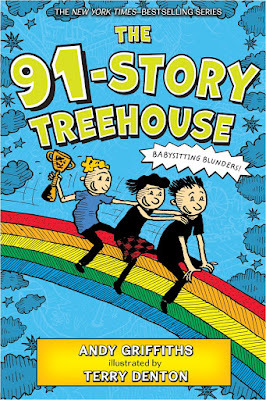 The 91-Story Treehouse which hits shelves in the US this week. I'm happy to welcome Andy Griffiths here to share about his vision and purpose creating this best-selling, crowd-pleasing series. "The Treehouse series is a comic-adventure-fantasy which employs lavish illustration & graphic nonsense on every page in order to tell a very silly but involving and complex story with a minimum of words. This gives us an unusually broad and passionate readership of emerging, reluctant and highly competent readers from 5 - 13 years old and we are especially proud that the series has equal appeal for both boys and girls. Each book in the series (and they can be read in any order) features a brilliant always-on-task writer called Andy—that’s me—and Terry, the irresponsible and easily distracted illustrator living in an ever-expanding fantasy treehouse while trying write a book for our bad-tempered & demanding publisher Jean Feiwel—I mean Mr Big Nose—who, if he doesn’t get his book on time gets so mad his nose explodes—but the problem is we can’t write the book because Terry keeps getting distracted by all the crazy stuff going on in the treehouse and then our intrepid and ever-resourceful neighbour Jill comes over and helps us sort it all out and then we write the book about all the crazy stuff that happened while we were trying to write the book and then we send it to Mr Big Nose just in time to prevent his nose from exploding." The New York Times compares Andy Griffiths to Roald Dahl, which I think is apt. "Mr. Griffiths’ work is both witty and fantastical, with a dark edge not dissimilar to Roald Dahl. In person, however, he is humble and thoughtful, if tightly coiled, with the taut, sinewy body of a long-distance runner and zany green eyes." I'd argue that the visual nature, drawing on cartoons and comics, makes these stories even more appealing to today's kids. Why 91 stories in this treehouse, you might wonder? Griffiths began with 13 levels in the first book back in 2011, and has added another 13 levels every year since. So you get the secret numerical code hidden in the titles: 13-26-39-52-65-78-91. Next March will bring The 104-Story Treehouse, which will bring the US completely up to date with Australia. If you’re wondering, our secret agenda—aside from evoking the exhilarating joy and freedom of imaginative play and converting non-readers into passionate book-lovers—is to teach children the sadly neglected 13 times table." My favorite part? I love how Andy gives total permission to laugh at anything -- whether it's stinky underwear or stuffing your face with marshmallows. He tells plenty of poop jokes, because he knows his audience (hello, have you listened to 8 year old boys? ), but he also gets us laughing at our greatest fears. He's got some great tips for young writers here. Also check out his website FAQs to learn more about his process. Many thanks, Andy, for all your creative storytelling and for working so hard to keep us all laughing. If you make a purchase using the Amazon links on this site, a small portion goes to Great Kid Books. Thank you for your support. I just returned from my annual "Librarians Gone Wild" weekend, otherwise known as the American Library Association Annual Conference. I'm filled with gratitude for my fellow librarians who help me think more carefully about my craft, and for the authors and publishers share their stories with us. Time and again, I was reminded of the power of stories and the responsibility we have in finding stories that will lift up young people. From former first lady Michelle Obama to best-selling debut author Angie Thomas, I was reminded of the important role stories play in our lives. 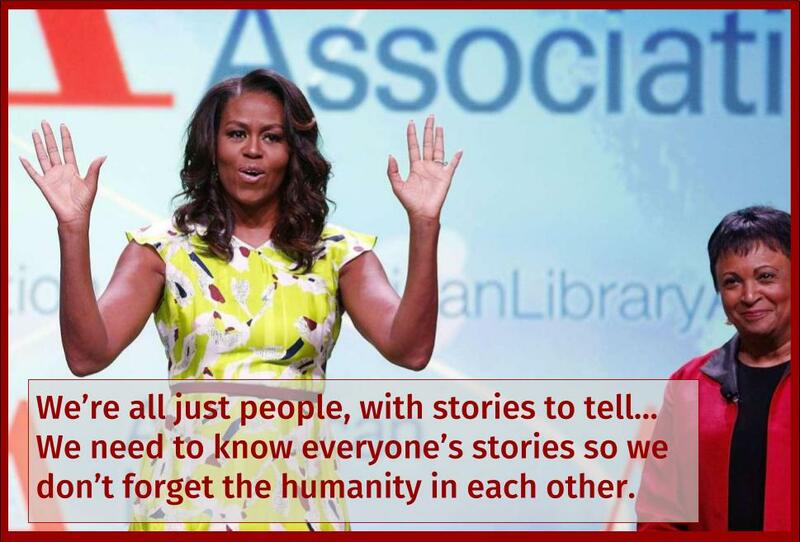 Michelle Obama opened our conference in conversation with Carla Hayden, the Librarian of Congress. I was inspired by the way she described the very ordinariness of her extraordinary story: "I grew up with music, art and love -- that's about it. There's no miracle in my story." Even more so, she talked about how important it is to learn about each other's stories and how we're all trying to figure it out. This video captures a key moment of her talk. As a child, I often felt unsure--unable to connect to my peers, alone yet surrounded by people. Books filled my imagination, helped me see myself and feel connected to the world. As a teacher, I have seen this same power of stories again and again. Stories can fill children's hearts and emotions, giving them courage when they feel most alone. Stories can spread laughter when everything around us seems heavy. They can help us see ourselves in other people's stories. They can make us feel less alone. Erin Entrada Kelly, winner of the 2018 Newbery Medal, spoke directly to this. 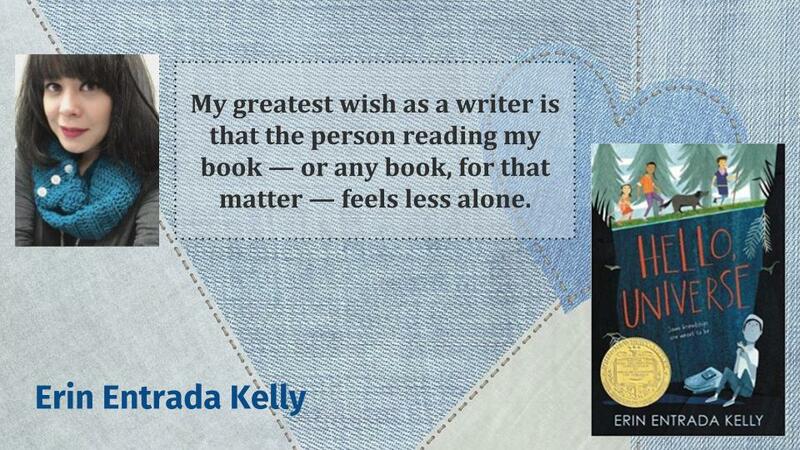 "My greatest wish as a writer is that the person reading my book -- or any book, for that matter -- feels less alone." She, too, often felt alone as a child, and it was through books that she discovered friends and companions. Yet children must see these stories as a piece of themselves. They must see themselves in stories, for when we don't recognize ourselves, what can anchor us--as Nina LaCour (author of We Are Okay) said in her Printz Award acceptance speech. Every day we are bombarded with terrible news, from school shootings to police brutality to inhumane immigration policies. Angie Thomas (author of The Hate U Give) said, "I often wonder what's the point of creating fiction when our society has failed young people so much." Yet I see every day young people determined to make it, to love and laugh and walk in this world. We need to give our children the message that the things they do, the people they are, all that they care about has value. In his preface to Out of Wonder, Kwame Alexander quotes poet and author Lucille Clifton: “Poems come out of wonder, not out of knowing.” I think the same can be said of our children. They grow when they are given the love, support and encouragement to wonder. We must listen to them, see them, love them.